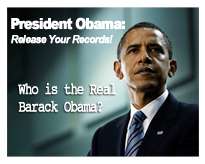 Sign petition calling on President Obama to release his records! President Obama's records were sealed prior to the 2008 presidential election. Why? Social Security records - explantion why Mr. Obama has been issued a Connecticut Social Security No. While you are at it MR. Obama, we would also like to see:teh situation photo while you were watching Benghazi attacks, the emails and memos denying security and support to US Embassy in Libya before teh 9/11 attacks, the khalidi Tape which has been kept hidden by LA Times, The Tony Rezco Land Documents, and Michelle Obama's Work Attendance Record and board of directors minutes . When Barack Obama was elected to the U.S. Senate, he obtained a $1 million earmark for the University of Chicago Hospital--and Michelle's salary as Vice President for Community Affairs jumped from $121,910 to $316,962. Her job: pushing poor, uninsured patients to other hospitals. She earned over $300K a year as she painted a false fairy tale of struggle during Obama capaigns. Why Hide What President Barack Obama Should Be Proud Of? President Obama was privileged enough to be able to attend Ivy League schools and travel extensively abroad when he was very young. Why wouldn't he be proud to show the American people his college transcripts and travel records? Most would be honored to release grades and writings from attending such ivy league schools. If President Obama is not ashamed of his college grades, maybe he is afraid of revealing poor test scores. Perhaps President Obama is covering up radical writings or fudged application s indicating he was a "foreign student" in order to get foreign student aid. How else would he have paid for college if his family was poor as he has indicated? Is it possible that President Obama fears what the American People will see in his college transcripts? Did President Obama get foreign student aid by noting on his college admission forms that his birthplace was actually"Kenya"? If President Obama took advantage of the Govt. for financial aid to attend ivy league schools, he shouldn't worry. Most Americans will forgive him. After all, we are a very forgiving nation. But why hide this from the American People President Obama? It is no secret who Barack Obama's heroes are, and they may also be reveled if we can see all his college writings, transcripts, college thesis, etc. We already know Mr. Obama was mentored by radical Marxist Frank Marshall Davis. We already know that among President Obama's heroes is Radical Marxist Saul Alinsky. What about his medical records? Does President Obama have a serious medical issue he has not told the American people? Does President Obama have sexually transmitted diseases? Do Americans have a right to know this? There are even some Americans who believe that President Obama is hiding a secret that could disqualify him to serve as President of the United States. We have to assume he is hiding something otherwise all these records, which all previous president have had to reveal, would not be hidden, sealed, and covered up. America wants to know why President Obama has a Connecticut Social Security number. What will really be revealed all President Obama's hidden documents and records and why were they all sealed so early on? What is he ashamed of? What is President Obama afraid of? What is he hiding from the American people. Why were his records sealed BEFORE he ran for president in 2008 and why do they REMAIN sealed? Lastly, If Donald Trump is willing to donate $5M to the charity of Mr Obama's choice, why in the WORLD wouldn't Mr Obama concede? What a great charitable gift Mr Obama could be responsible for! Most Americans don't realize we have elected a president whom we know very little about. We are getting close to the 500,000 signatures needed but America needs more like you so sign today then pass this along to your friends and family! Want to be notified With Updates from ReleaseTheRecords.com?